The picture on the right is of the Kirin Brewery in Sendai, in the Miyagi Prefecture roughly 235 miles north of Tokyo and just off the Oshika Peninsula. 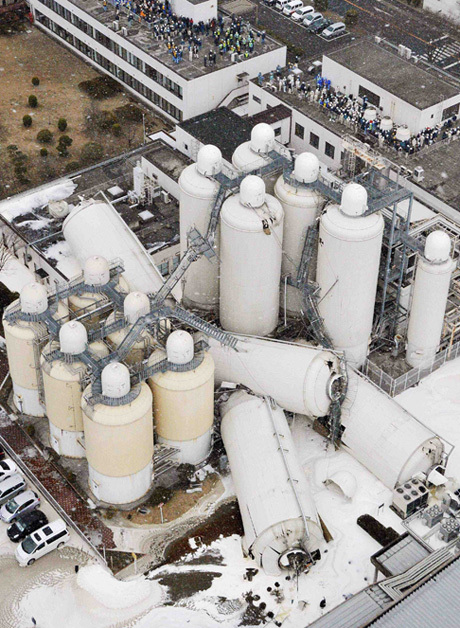 Sendai was devastated by Friday’s earthquake, and four large holding tanks at the brewery were destroyed. In the picture, staff gather on the roof tops of the buildings in search of safety while the white foam you can see on the ground is spilled beer.